Dynamo Kursk, with our coaches Lucas Mondelo, César Rupérez and Roberto Hernández, remain still unbeaten this season after defeating UMMC Ekaterinburg on Sunday, 77 to 68. 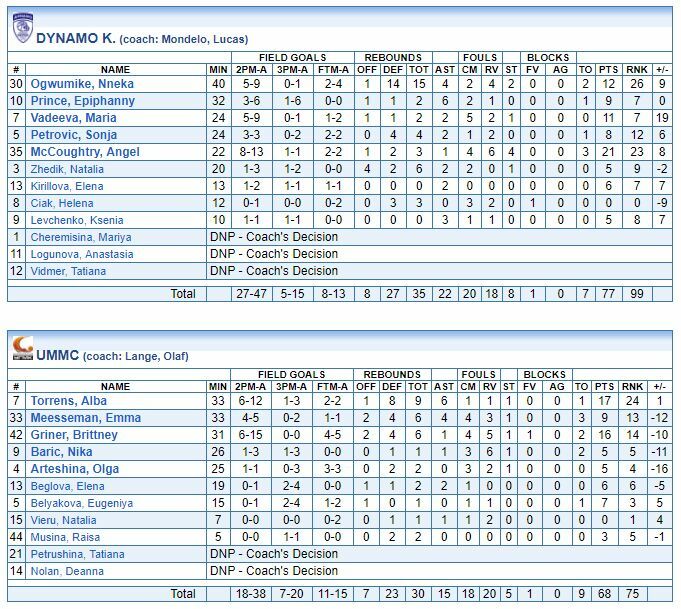 With this win, Dynamo Kursk holds the Russian League 1st position (9-0) and has collected a 9 point differencial that will have to be defended in the return game against Ekaterinburg (March 24), in order to keep the home advantage in the Russian League Playoffs. On wednesday, Lucas, César and Roberto will try to remain also undefeated in the Euroleague (8-0) and will face Villeneuve d´Ascq in a tough away game. Lucas Mondelo and César Rupérez, who already won the Euroleague last season with Dynamo Kursk, accumulate 25 consecutive wins in this competition, for sure one of the longest streaks (if not the longest) in the history of the competition. Lucas, César and Roberto have also won the Russian Cup and the European Supercup this season. Lucas Mondelo is a Spanish professional coach born in Barcelona in 1967 who has had an unbelievable career at the highest level, achieving by far more success than any other european coach in the last 10 years. Lucas Mondelo had his first professional experiences in Spanish Liga Femenina 2, coaching Viladecans, Nácex Jovent and finally promoted with Olesa to Spanish First Division where he finished in Liga Femenina seventh, fifth and eight positions and reached the Queen´s Cup Semifinals. In the 2009 summer, Lucas Mondelo won the Silver Medal with the U19 Spanish National Team in the World Championship played in Thailand, defeating a USA team with Nneka Ogwumike, Skylar Diggins, Kelsey Bone and Shenise Johnson in the first rounds and winning all the games until losing in the Final to this USA team. In the 2010 summer, Lucas Mondelo was another Silver Medal, this time in the U20 European Championship, again winning all games except the Final with Russia (75-74). Lucas Mondelo signed with Perfumerías Avenida in the 2010/11 season and he had an incredible year, becoming Spanish Supercup Champion, Spanish League Champion and Euroleague Champion. 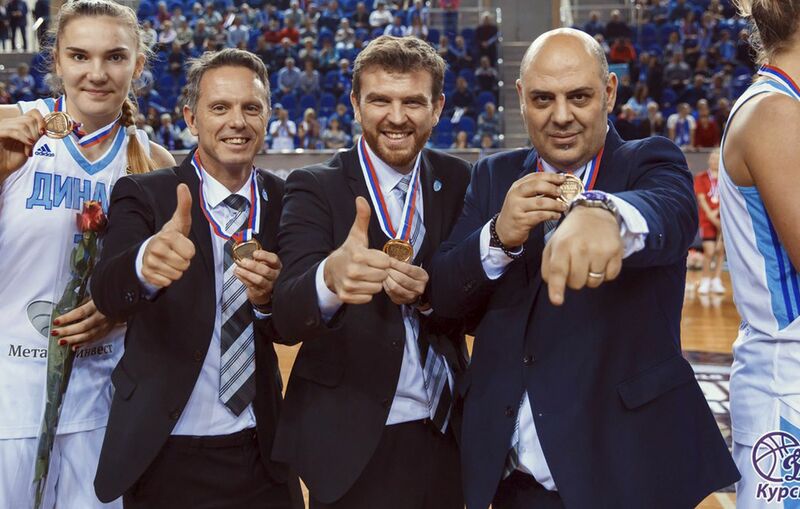 In the 2011 summer, Lucas Mondelo coached again the U20 Spanish National Team and he won the Gold Medal in the European Championship played in Serbia. Lucas Mondelo extended his contract with Perfumerías Avenida in the 2011/12 season and he completed a run of 38 consecutive wins in Spanish League and in Euroleague (from October 18, 2010 until 25/11/2011), including wins against Galatasaray, Spartak Moskow (2), Wisla Krakow (2), Ros Casares (4), CCC, Tarbes (2), Rivas (2) and Nadezhda. Perfumerías Avenida could not keep their main players and after building a roster with 7 new players, Lucas Mondelo won the European Supercup against Ramla (95-72) and the Spanish Supercup against Rivas (77-65). In March 2012, Lucas Mondelo won the Spanish Cup, defeating Ros CAsares who, at that time, had probably the best roster ever built in Europe (Maya Moore, Lauren Jackson, Sancho Lyttle, Yacobou, Palau, Domínguez, Vesela, Shay Murphy, Ann Wauters..) and that won the League and the Euroleague in that season. With the Spanish Cup, Lucas Mondelo had won his 7th trophy in 2 years and had won everything that a Spanish coach can win in a Spanish team. In May 2012, Lucas Mondelo was appointed as Spanish National Team Coach and qualified Spain for the 2013 European Championship. In the 2012/13 season, Lucas Mondelo signed in China with the Shanxi Riu Flame and together with Maya Moore and César Rupérez he won the Chinese League, which was a huge overperformance with a roster that was coming from 2nd division and had no Chinese international player. In the 2013 summer, Lucas Mondelo won the Gold Medal in the European Championship played in France and he was unbeaten during all the tournament and defeated France in the Final. Lucas returned to China in the 2013/14 season and he won again the Chinese League with the Shanxi Riu Flame, tying the historical record for most consecutive wins in Chinese League and being named as coach of the North team in the All Star Garme. In October 2014, Lucas Mondelo won the Silver Medal in the World Championship played in Turkey, losing the Final against the United States and breaking a 32 consecutive win streak with the Spanish National Team. In the 2014/15 season, Lucas Mondelo extended his contract with the Shanxi Riu Flame and won his third consecutive Chinese League. In the 2015 summer, Lucas Mondelo won the Bronze Medal with the Spanish National Team in the European Championship played Hungary, defeating Belarus (74-58) in the Bronze Medal game. After coaching for a 4th season the Shanxi Riu Flame, Lucas Mondelo won the Silver Medal in the 2016 Olympic Games in Rio de Janeiro. Lucas Mondelo returned to Europe in the 2016/17 season and he signed in Russia with Dynamo Kursk. Again, Lucas was very successful and he won his second Euroleague, not losing any game in the whole competition. Also, his Dynamo Kursk played the Russian League and the Russian Cup Finals. In the 2017 summer, Lucas Mondelo won the Gold Medal in the European Championship played in Czech Republic. Lucas Mondelo extended his contract with Dynamo Kursk in the 2017/18 season and he won the European Supercup against Yakin Dogu and the Russian Cup.